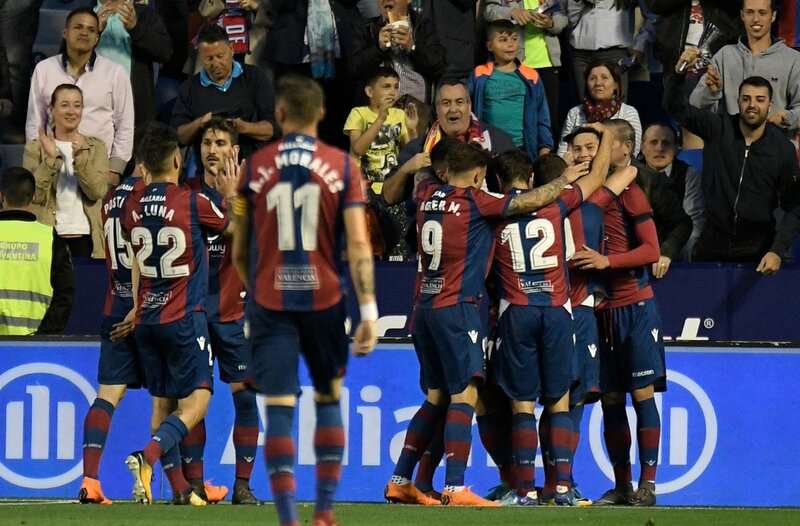 Madrid: Barcelona’s pursuit of an unbeaten La Liga season came to end in spectacular fashion on Sunday evening as bottom side Levante stunned the Catalans in the penultimate match by winning the 9 goal thriller, split 5-4. Emmanuel Boateng scored a superb hat-trick and Enis Bardhi added a brace to give the home side a dreamy 5-1 lead in the hour mark after Philippe Coutinho had pulled one back in the first half with the scores at 2-0. The rescue operation of the Blaugranas led by the Brazilian who completed a stunning hat-trick just after the hour mark and a controversial penalty goal by Luis Saurez could not salvage a point for the already crowned Barca and take the season for the final match at home without losing a single game. Barca who played a 2-2 el clasico draw with 10 men against Real Madrid in the last match were welcomed with a traditional guard of honour. The visitors who were without super star Lionel Messi started the game well taking the early possession and forcing Levante defence until Boateng scored inside 10 minutes from close range against the run of the play. The young Ghanaian doubled his goal at the half an hour mark as he took advantage of Thomas Vermaalein out of pitch injured and evaded another defender to round off displaced Marc-Andre Ter Stegan and slam home into the empty post. Alarmed with Levante’s second of the evening Barca started the response as Coutinho scored in his trademark finish in the 39th minute to bring the champions back to the contest. But an onslaught in the early minutes after the break put the Granotas in an embarrassing 5-1 lead against a side expected to be Invincibles in the whole season. Inside the opening minute of the second half Bardhi curled a fabulous strike past the outstretched Ter Stegen to create frenzied celebration at Estadi Ciutat de València. In less than five minutes Boateng fired his third of the evening to become the first player to do so against Barca in this season. It was followed by another Levante goal to inflict Barca into utter humiliation as Bardhi fired a curling shot into Ter Stegen’s net for the second time of the evening. Trailing 5-1 Earnesto Valverde’s side started the fight back as Coutinho reduced the deficit to three after eventually slamming home from close range after Suarez’s shot was blocked in the 59th minute before completing his hat-trick with another deflected shot after five minutes. In the 71th minute Suarez scored from the penalty spot after Sergio Busquets was fouled to set up a tense final. But Francisco José López’s side avoided a heartbreaking result by holding on to condemn the Catalans their first defeat in last 44 league games. Barca boss was understandably disappointed by the sloppy display of his team against a team that improved completely since Lopez took charge as the head coach recently. “We are frustrated to not finish the league unbeaten but we have to appreciate getting to this point.” The Sapniiard said in post-match press conference. “These records look easy but they aren’t. There are lots of variables, it is normal to have days where things don’t quite work for you and everything goes right for the opposition. It was a strange game, they were very effective and they punished us with three great counter-attacks.” He added. Lopez was full of praise for his brave players who worked hard for a famous win against a mighty side like Barcelona. He said it was “historic” for Levante, in their first season back in the top flight following promotion, to beat Barcelona. In the final match of the La Liga season Barca will host 10th placed Real Sociedad on 20th May Sunday.